As a responsible homeowner that values the beauty of Maine, you don’t mind a little hard-work, sweat, and investment in keeping your yard lookin’ good. However, you don’t want to break your back or your budget. Adopting more eco-friendly practices into your lawn care routine may require a little extra time and money up front, but if you’re resourceful, in just a few seasons, you will have a happy, healthy lawn that not only looks great, but is also self-sustaining. Perhaps you’ve been reading more about lawn care and are looking to make more environmentally minded choices to have a truly healthy ecosystem in your yard. Conventional lawn care practices of the past relied on synthetic chemicals that may have turned your grass green and lush but left the soil devastated, void of nutrients, minerals, and microorganisms that are needed for a truly healthy lawn. Making eco-conscious choices for your lawn doesn’t have to be dramatic or blow up your plans for the season – remember, having an eco-friendly lawn is a marathon, not a sprint. There are several little things that you can start doing or thinking about now that will improve your lawn over time, all while making it more sustainable. Mow regularly. Most homeowners cut their lawns too short. Mow regularly and at the right height, between two and three inches. This is the ideal height that will encourage the roots of your grass to grow deep, where they can be healthy and thrive in the soil. Cutting your grass too short can damage the root system, burning out your lawn in summer and freezing it in winter. Grass that is too tall can matte when mixed with rain and leaf litter causing a lack of oxygen leading to mold which can be deadly. Have a weed management plan. The BEST weed prevention comes with a healthy, thick lawn. Hand-pulling those pesky weeds is the next best thing paired with aerating and overseeding to thicken your grass turf, leaving the weeds nowhere to grow. Remember that not all weeds are bad. It’s time to decide which weeds you can tolerate, especially those that benefit pollinators (like dandelions) and which ones are just a nuisance (like crabgrass). Once you’ve decided which ones can stay and which ones need to go, it’s time to spend some quality time on your lawn. It can be a bit of work at times, but the effort to pull up the entire root system will help prevent return growth. When the next season comes, you’ll start to notice fewer weeds and more grass automatically! If you opt to hire a lawn care company, make sure they are following best practices for weed treatments that include spot applications, not blanket treatments. If you want 100% organic, you will need to focus on building a healthy soil ecosystem that supports thick grass growth and will need to hand pull those weeds. Aerate and overseed in the fall. This duo is an effective way to make sure that nutrients, water, and oxygen can get into the soil while thickening thin or bald areas of grass. It’s also a great compliment to your weed management plan. The warm days and cool nights of autumn make it the optimal time for grass to grow from an overseeding. Paired with aeration, which removes tiny plugs of grass and soil, overseeding strengthens the root system of your grass while ensuring that essential nutrients make it into the soil where the roots need it most. You will notice as your grass becomes more thick and lush that your weed population is shrinking. Be diligent with grub prevention. The most effective, eco-friendly option is a grub preventative product, free of neonicotinoids. Grubs can devastate the root system of your grass which makes an outbreak easy to detect as random dead patches of grass emerge in late summer. Before you start seeing these brown patches emerge, take preventative action with grub prevention products that are free of neonicotinoids which are toxic to honey bees and other pollinators. As you build up the health of your lawn, you may find that your turf can better handle the presence of grubs – but preventative care is critical. While nematodes are a 100% organic curative treatment option for grubs, they are only applicable after an outbreak and not nearly as effective as preventative products. Should you work with a lawn care company to help with your grub situation while being eco-aware, be diligent and demand that they treat with neonicotinoid-free products that are certified bee-safe; nematodes if you are going 100% organic. Use natural organic fertilizers. Leave the synthetic fertilizers on the shelf. If your town has a lawn care ordinance in place, chances are you are no longer permitted to use those products anyway. Synthetic fertilizers sure do make your grass look green and lush, but those chemicals are stripping away nutrients and microorganisms that occur naturally from the soil. If you’ve used synthetic fertilizers in the past, you may need a season or two for your grass to thoroughly detox and for the soil to replenish its ecosystem. Using all-natural organic fertilizers may be an adjustment but will help rebuild your natural lawn. Plus, your kids and pets will be able to enjoy the yard immediately after treatment. With the advent of highly effective organic fertilizers and treatment products, you no longer have to choose between having a healthy environment and a great looking lawn. At Lucas, we’re here to help you focus on the soil and the health of the plant. We’re stewards of lawn, tree and plant health that provides environmentally responsible lawn care options for the eco-friendly homeowner. Our trusted lawn care professionals will ensure your lawn only receives what it needs, sparing unnecessary applications and costs. 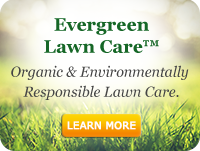 Select from our three Evergreen Lawn Care options that fit your vision for a healthy, eco-friendly lawn.